Netting aims to develop a tool to efficiently move between digital simulations to physical prototypes of fiber structures. As designers we have become discontent in the separation of design thinking and making. Our labs, offices, and studios are increasingly equipped with analog and digital tools allowing one to make tactile realities of digital creations. The re-engagement with the craftsperson has (and will continue to) lead to custom solutions deviating from the homogenous, mass produced, stock material prevalent since the Industrial Revolution. The accessibility and range of tools will expand the designer's repertoire, introducing new materials and methods to craft custom solutions. 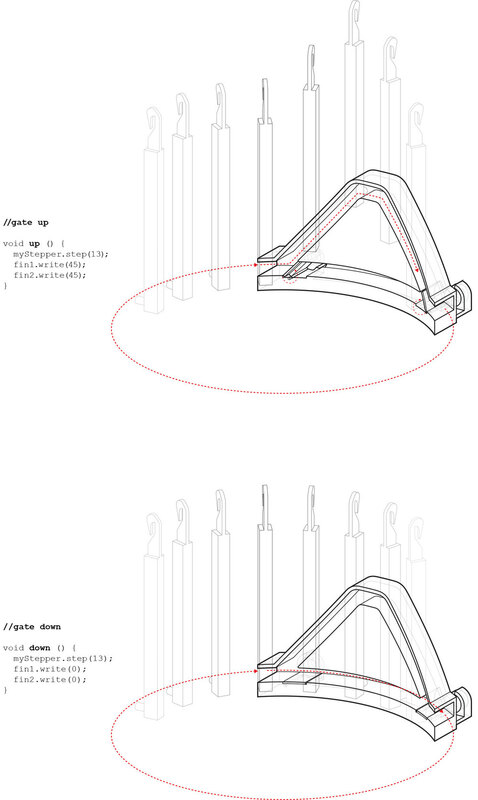 A tool for prototyping fiber structures is not yet commonplace in the architect's toolbox however there is precedent of designers and hobbyist engaging in tool creation for specific design intents. 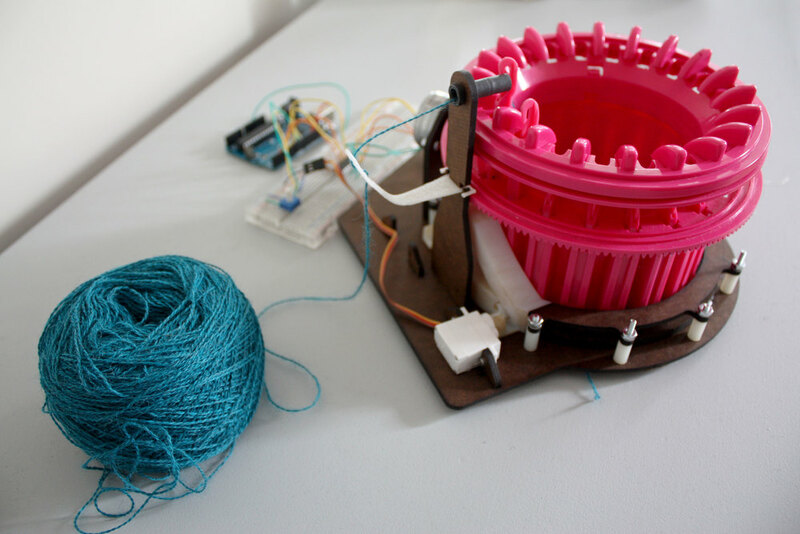 A research group lead by Marta Male Alemany at the DRL of London’s Architectural Association created an automated circular knitting machine to prototype small-scale lightweight tower structures. By automating the rotation of the knitting carriage, design parameters such as height and basic form (panels or tubes) are achieved. The tool along with a custom interface produces various cylindrically branching structures. In addition, Gerard Rubio, a hobbyist in Barcelona, has developed an open source machine, OpenKnit, bringing bespoke clothing production to the home. The interface allows users to adjust sizing and color parameters to create one of a kind sweaters, hats, and scarves. While one line of inquiry is in the creation of a tool, the other investigates practices of fabrication and engineering of fiber structures. Performance textiles are gaining popularity in many industries including sail construction and athletic wear for their implementation of precise fiber placement. The sailing industry employs robotic arms to place high performance fibers according to structural analysis of wind loads. Performance athletic wear, such as Nike’s Flyknit, uses CNC knitting machines to place fibers in patterns to optimize fit and reduce the product weight, material waste, and assembly time. The advances in sail and athletic technology, to name a few, are applicable to tensile architectural structures. Structural optimization software can guide the placement of material according to performance needs restructuring the once homogeneous textile. A machine accessible to designers which outputs tactile prototypes will aid in the cyclical loop of digital design and physical material testing of fiber based structures. Netting is a prototyping tool to aid designers in the production of both formal and structural solutions to tensile architectures. The machine began with an inexpensive circular knitting toy designed to knit continuous rows at the crank of a handle. The toy was transformed into an automated machine by recycling the carriage containing the knitting needles and building a custom formwork to contain a computer driven assembly of components. 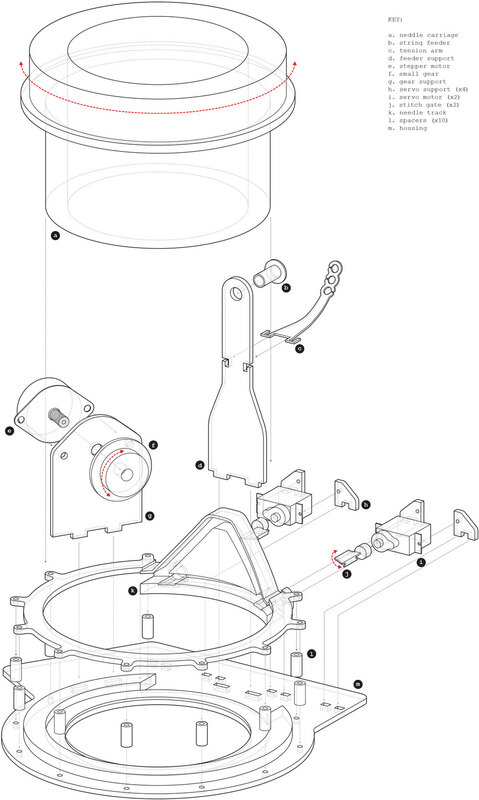 First, a stepper motor turns the carriage clockwise and/or counter clockwise in 360 degree rotations to form a tube or 180 degree half rotations to form a sheet. Next, a custom track was designed to allow the needles to bypass the path to the yarn creating variations in the once continuous patterns of the original toy. The gate that informs the path of each needle is controlled by a small servo motor. The stepper and servo motors are acting in parallel controlled via arduino. To test the capabilities of the machine I will develop a workflow to move between digital simulations and physical prototypes. To accomplish this, principle stress paths extracted from structural analysis software will be reinterpreted to align with the limits and language of the machine. Physical prototypes will be in constant production to validate and inform the digital intentions while promoting exploration of material and tactile qualities. Rather than utilize the machine as a form generator, I intend to test it against the precise placement of fibers through a series of investigations of net structures outlined by Frei Otto in IL Publication 8 -Nets in Nature and Technics. Through a series of soap film tests and investigation of spiderwebs, Otto identified elements of net structures beginning with the basic components (cables, nodes, mesh faces, and boundary) and organization of the mesh (grid-like, radial, or irregular) to the complex geometries and anchoring techniques to create a structural light-weight, adaptable architecture. My use of the tool stems from the desire to control specific physical outputs that test the material and tensile properties of various mesh types and forms.